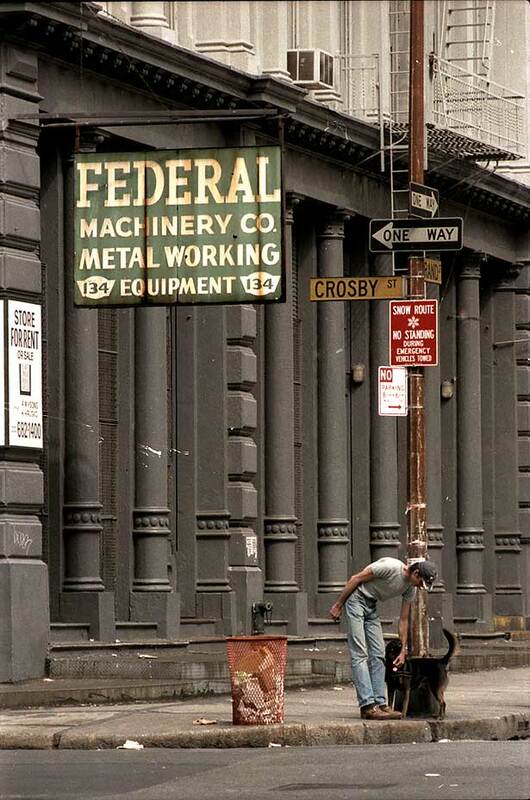 Federal Machinery Co. started out on Centre St. around 1930 as the Federal Machinery Exchange, and they were located at both 224 Centre St. and 134 Grand St. from approximately 1940 to 1943. The Manhattan telephone directory listed them at 134 Grand Street from 1940 through 1986. In the New York Times, 21 June 1964, death notices for Hyman Kaplan (1894?-1964) read: "Kaplan - Hyman, beloved husband of Jeannette, devoted father of Rissa Sklar and Paula Kaplan, dear son of Mollie and loving brother. Services at Riverside Chapel, 1963 Grand Concourse, Bronx (179th St.), 1 P.M. today" and "Kaplan - Hyman. The employes of Federal Machinery Corporation sorrowfully announce the untimely passing of our beloved employer. Morris Kupietz, President." I have not otherwise been able to identify Hyman Kaplan. Morris Kupietz (1899-1992), however, president in 1964, seems to have been associated with the business from early on. He was recorded in the 1930 U. S. Census as a "Speculator, Machinery," age 30, born Poland, immigrated 1913. His wife, Fannie Benenson Kupietz (1900-1976), was listed as an officer at Federal Machinery Exchange, 224 Centre St., in Polk's 1933-34 New York City Directory. In their later days Federal Machinery Corp. was associated with two out-of-town companies, Dreis & Krump Mfg. Co. from Chicago, and Whitney Metal Tool Co. from Rockford, Illinois. Federal Machinery may possibly have served as a New York representative of these companies. This ad for Dreis & Krump Mfg. Co. appeared in a publication called The Dodge Idea, vol. 38, no. 7, July, 1922. This ad for Whitney Metal Tool Co. appeared in Metal Worker, Plumber and Steam Fitter, 5 July 1918, p. 43. As of July, 2014, Dreis & Krump is still in business. You can visit their website at http://www.dreis-krump.com/.